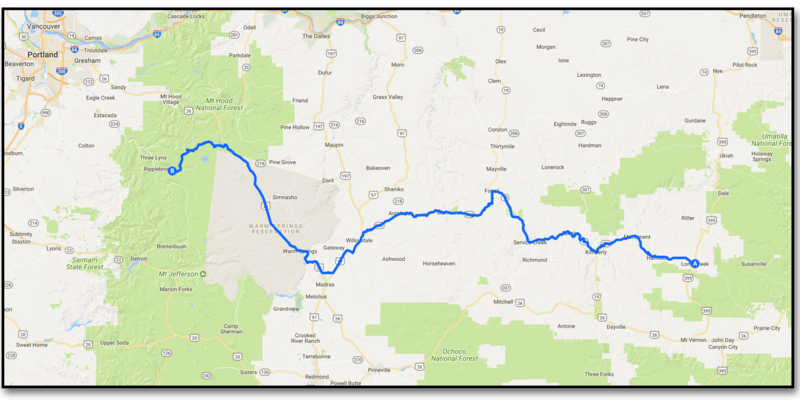 Day Twenty One, Zone of Totality (near Long Creek, Oregon) to Lake Harriet, Mount Hood National Forest. Well it finally arrived, the total eclipse of the sun! We got up and ate breakfast and then climbed up to our scenic vista at 5500 ft. to experience the eclipse. It is really something to see the changing light and see the earth go dark and the stars come out – all in an hour or so. Truly a once in a lifetime experience. After the eclipse was over we headed for the coast and our halfway stop of Harriet lake in the Mount Hood national forest. The traffic getting out of the eclipse zone was bad in spots, but we managed to avoid most of the traffic as we weren’t going to Portland, but it added about an hour to our (already long) journey. Some NASA dude took this photo in Salem – but this is how it looked to us (honest!). The light went all weird before the blackout (taken from our vantage point). It’s a bird – no, it’s a plane! No, it’s an eclipse!